In developing countries, tuberculosis (TB) is a major public health problem and the leading cause of death among patients with HIV (Human Immunodeficiency Virus). Until 2001, the tuberculin skin test (TST) was the only available tool for the diagnosis of latent tuberculosis infection (LTBI), but false-negative TST results are frequently reported. Recently, the interferon-γ (IFN-γ) release assay (IGRA) has gained ground because it can detect the IFN-γ secreted by circulating lymphocytes T cells when stimulated by specific TB antigens. However, the role of IGRA in the diagnosis of LTBI in HIV-infected patients has not been well established. This cross-sectional study compared the accuracy of TST (performed by the Mantoux method) and IGRA (QuantiFERON-TB Gold In-Tube, Cellestis, Carnegie, Australia) on the diagnosis of LTBI among patients with HIV. LTBI is defined by LTBI risk and at least one positive test (TST or IGRA), without clinical evidence of active TB. We also assessed the accuracy of TST and IGRA among HIV patients with high and low risk for LTBI. Among 90 HIV patients, 80 met the study criteria for LTBI, fifty-nine (73.7%) patients were TST positive, 21 (26.2%) were negative, whereas 75 patients (93.7%) were IGRA positive, and five (6.2%) were negative. TST showed poor agreement with the diagnosis of LTBI (Kappa: 0.384), while IGRA demonstrated good agreement (Kappa: 0.769). Among 69 patients with high risk and 21 with low risk for LTBI, TST was positive in 48 (69.5%) and 11 (52.4%), while IGRA was positive in 68 (98.5%) and 7 (33.3%) patients, respectively. There were no association between TST and the level of risk (P = 0,191). Conversely, we observed a strong association between the IGRA and risk for LTBI (p < 0.001). Compared to TST, IGRA positivity is consistent with the risk of TB infection and seems to be a better diagnostic tool for LTBI in HIV-infected patients. One-quarter of the world population is estimated to be infected with Mycobacterium tuberculosis, while 10.0 million cases of TB occurred worldwide in 2017 [1–3]. The best estimate is that there were 1.3 million TB deaths in 2017, with an additional 300.000 deaths resulting from TB disease among the population living with HIV . TB is a major public health problem in Brazil and the leading cause of death in patients with AIDS and one of the most common opportunistic infections [4, 5]. Moreover, recently published data collected in the city of São Paulo found that among 78.6% of patients diagnosed with tuberculosis who underwent HIV testing, 9.9% were coinfected . A significant number of active TB cases arise in people with LTBI within a period of 2–5 years following primary infection . Between 5 and 15% of individuals with LTBI progress to active TB, and the risk of active TB increases with poor immunity, reaching 30% among individuals infected with HIV [3, 8, 9]. The available tests for the diagnosis of latent TB infection (LTBI) have limitations that pose great challenges for both the diagnosis and the treatment of these patients [10, 11]. Indeed, the diagnosis of LTBI is a worldwide problem due to the lack of a gold standard. In countries with a high incidence of tuberculosis, including Brazil, the diagnosis of LTBI has been based upon a positive TST test in individuals in whom TB disease has been ruled out [4, 5]. The TST is an easy and low-cost test to apply, although, its specificity may be affected by previous BCG (Bacillus Calmette-Guérin) vaccination or even by infection with nontuberculous mycobacteria . In addition, false-negative TST results can be observed in anergic or immunodeficient patients, including individuals with AIDS . Over the last years, IGRA has gained ground as an alternative to the TST because it can detect the IFN-γ secreted by circulating lymphocytes T cells when stimulated by specific TB antigens. It can be measured in the blood and used as a tool for the diagnosis of LTBI [14–17]. Studies comparing the use of the IGRA and TST for the diagnosis of LTBI have shown that the IGRA has higher specificity, especially among populations submitted to BCG vaccination . Nevertheless, the TST and IGRA both have suboptimal sensitivity, and conflicting results are common. It has been described that TST have particularly low sensitivity when testing immunocompromised individuals for LTBI, and thus might not be an adequate diagnostic tool applied for patients with HIV . Conversely, the IGRA seems to be highly specific for the detection of LTBI, especially in BCG-vaccinated individuals and may help to identify LTBI in HIV-infected immunosuppressed patients . The detection of LTBI and the treatment of patients at increased risk for developing active TB are the only effective strategies to prevent the development of tuberculosis [3, 5, 8]. Since validated guidelines for the proper diagnosis of LTBI in HIV patients are lacking, we hypothesized that applying IGRA would improve the diagnosis of LTBI compared to that with conventional TST test in adults infected with HIV/AIDS. Furthermore, we assessed the accuracy of TST and IGRA in HIV-infected patients presenting higher and lower risk for LTBI. This work was a cross-sectional study of 90 HIV-infected individuals older than 18 years, at risk for LTBI and recruited between March 2012 and April 2013, at the Santa Casa de São Paulo School of Medical Sciences, Clemente Ferreira Institute, and Emílio Ribas Institute of Infectious Diseases in São Paulo, Brazil. Patients diagnosed with mycobacteria other than TB, as well as patients with other known causes of immunosuppression, including type 1 diabetes, cancer, and/or the use of immunosuppressive medications, were excluded from the study. This study was approved by the ethics committees of all three institutions involved with this study. Only those individuals who agreed to participate and who signed the informed consent form were included in the study. Latent tuberculosis infection (LTBI) is characterized by the presence of immune response to previously acquired Mycobacterium tuberculosis infection without clinical evidence of active tuberculosis . LTBI was defined as those with a definite risk of LTBI (high or low) with at least one positive test (TST or IGRA), in which tuberculosis disease was absent (clinical manifestations of TB and/or radiological signs suggesting TB), and with smear-negative for tuberculosis in at least two sputum samples. The LTBI risk definition was established according to previous studies [4, 20–22]. High risk patients for LTBI was defined based upon extensive period of household contact with a smear-positive pulmonary tuberculosis person, which may have occurred during nocturnal as well as extensive diurnal periods. In addition, TB index-case patients should not have started TB treatment and presented signs and symptoms of active disease, including cough longer than 3 weeks plus at least one of the following: (a) losing 10% of body weight, (b) fever (> 38 °C), and (c) night sweats. Individuals with low risk were those with outside household contact history not sharing the domicile, but instead they share the same physical space at work, during educational or social activities with the index case. In addition, index case should not have started TB therapy and presented with only one of the following signs or symptoms of the index case: cough (> 3 weeks), fever (> 38 °C), sweating or weight loss (> 10% of body weight). The principal distinction between high and low risk patients for LTBI was presence of household contact and cough in the high-risk group. The main diagnosis criteria for active TB in the index case was microbiology; presence of sputum with positive direct bacilloscopy (by Ziehl-Neelsen staining), culture in Lowenstein-Jensen medium or an anatomopathological examination showing caseating granulomas and acid-fast bacilli in tissue specimens. The lung tissue fragments used in the anatomopathological study were obtained by means of transbronchial biopsy. Negative microbiological results on smears or lung tissue cultures were excluded despite the presence of cavities on chest x-ray. Individuals who were double-negative for TST and IGRA were considered LTBI-free. TST was performed using the Mantoux method , with intradermal administration of 0.1 ml purified protein derivative (0.1 ml tuberculin PPD RT23 2 TU, SSI, Copenhagen, DK) on the middle third of the anterior face of the left forearm. The reading occurred 48–96 h after the application, using the palpation method of the maximum transverse diameter of the induration and using a ruler in millimeters for measurement according to the National Health Foundation recommendations. For all individuals who participated in the study, it was considered a reactive when the size of the induration was ≥5 mm. The IGRA was performed according to the manufacturer’s recommendations (QFT-GIT manufacturer: Cellestis, Carnegie, Australia). Blood samples for IGRA testing were collected and the blood samples were transported to the Instituto Clemente Ferreira (ICF, São Paulo, Brazil). An aliquot of 3.0 ml of blood was withdrawn by trained technicians. Three tubes were marked with the same identification number of the patient’s questionnaire: negative control bottle (gray cap), vial coated with tuberculosis-specific antigens (red cap) (ESAT-6, CFP-10, TB7.7 [p4]) and positive control vial coated with phytohemagglutinin as mitogen (purple cap). After collection and homogenization, tubes containing blood were incubated at 37 °C for 16–24 h and kept upright during this period. After 16 to 24 h the tubes were centrifuged and then the plasma was separated and frozen at − 70 °C. When the number of patients required to perform an ELISA plate (29 patients) or two plaques (58 patients) was reached, the ELISA assay was performed. Each patient had their plasma sample evaluated for the production of interferon gamma by lymphocytes after stimulation by specific antigens of the M. tuberculosis, inert antigens (negative control) and mitogens (positive control). After obtaining the ELISA crude values, these were analyzed from a specific software for QuantiFERON®-TB Gold In Tube and the results further calculated. The program evaluates the quality of the analyzes, generates a standard curve and provides a result for each individual. The final test result may be positive or negative. Those with antigen TB values ​​minus Nil (TB Ag-Nil) greater than or equal to 0.35 IU/ml are considered positive. In the study, the “undetermined” result of the IGRA was considered as “positive”. Treatment for LTBI was recommended to individuals who were positive for either TST or IGRA and for whom TB disease was ruled out, following the standards of the Brazilian Ministry of Health [4, 5]. For this study, we considered T lymphocyte subpopulations CD4 + and CD8 + counts, obtained by flow cytometry up to three months before the data collection . To investigate whether an association exists between the TST and the IGRA, we used the McNemar test. If agreement between variables was found, then we used the Kappa value to determine the level of agreement. To evaluate the values of CD4 + T cells according to the result of the TST and IGRA, we used the Mann-Whitney test. To examine the association between the test results and the risk of LTBI, we used Fisher’s exact test, the McNemar test (if there was agreement), and the Kappa value, if needed, to determine the degree of agreement . Receiver operating characteristic (ROC) curve was used to verify the possibility of identifying cut-off values of CD4+ T and CD8+ T cells, to optimize the sensitivity and specificity of the test results in accordance with the risk of LTBI. It was also plotted to compare the diagnostic accuracy of tests. We defined the following agreement levels: no correlation between the variables when the Kappa value was less than 0.20; poor or fair agreement for values from 0.21 to 0.40; moderate agreement for values from 0.41 to 0.60; good agreement for values from 0.61 to 0.80; and strong agreement for values from 0.81 to 1. A significance level of 5% (0.05) was adopted throughout the study. We used the statistical software Predictive Analytics Software 17.0.2 (PASW Statistics 17.0.2). Initially, 106 patients were considered eligible for the study. Of these, 16 were excluded, three for not agreeing to sign the consent form, five for not returning for TST reading and eight for lack of recent CD4 + T lymphocyte count and HIV viral load (last three months before the data collection). Therefore, 90 HIV-infected patients at risk of latent tuberculosis infection were included in the analysis, of which 56.7% were male with a mean age of 39.2 (± 10.9) years. Most of them (93.3%) were under antiretroviral therapy and 95.5% had been previously vaccinated for tuberculosis with BCG vaccine. Those classified at high and low risk for TB infection were 69 (76.6%) and 21 (23.3%) patients, respectively. Other clinical characteristics of the study population are shown on Table 1. The median values of CD4 + and CD8 + T cells, and HIV viral load are described in Table 2. Briefly, CD4 + T cells median value was of 557.5 (± 283.89) cell /mm3, and mean HIV viral load values was 514.5 (± 1814.02) copies/ml. Among 90 HIV patients, 10 patients were TST and IGRA tests negative and therefore did not meet the study criteria for LTBI. However, we could not tell whether these individuals were truly negative for LTBI or whether they were false-negative individuals. Among them, average age was 41 years, the average time of active TB exposure to infected individuals was 1.7 months, and the average CD4+ T cell count ​​was 415 cells/mm3. All patients were receiving ART and had undetectable viral load, hence were most likely not to be infected with TB. Table 3 summarizes the frequencies of TST and IGRA results in 90 HIV-infected patients included in the study. Briefly, among 80 patients who met the study criteria for LTBI, 59 (73.7%) were TST positive, while 21 (26.2%) were negative. In contrast, 75 (93.7%) patients with HIV and with LTBI were IGRA positive, and only five patients (6.2%) were negative. When assessing the level of agreement between TST and IGRA with the diagnosis of LTBI, TST showed poor agreement (Kappa: 0.384), while the IGRA showed good agreement (Kappa: 0.769). 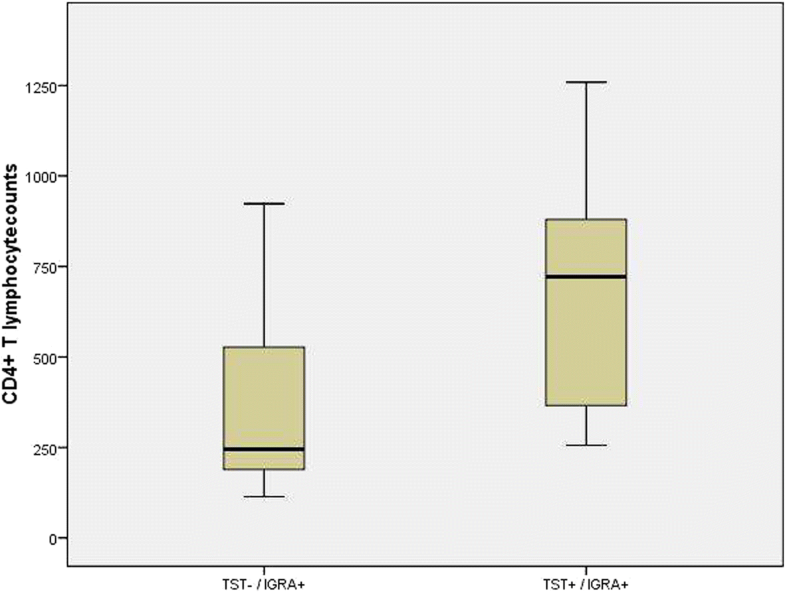 Interestingly, only one patient presented indeterminate IGRA result, but with TST positive. This patient had a normal CD4 + T lymphocyte count (938 cels/mm3). Regarding discordant results between tests, 21 patients presented negative TST and positive IGRA. These patients had an average CD4 cell count of 245 cells/mm3, while patients with both TST and IGRA positivity (n = 54) had an average CD4 cell count of 721.5 cells/mm3. Indeed, the average CD4 cell counts in the group presenting TST negative and IGRA positive were significantly lower than in the double-positive (TST and IGRA) group (p < 0.001) (Fig. 1). Among 69 (76.7%) patients presenting high risk for TB infection, TST was positive in 48 (69.5%), negative in 21 (30.5%), respectively. No significant association was found between the TST and the level of risk (p = 0.191). On the other hand, IGRA was positive to all but one patient (98.5%). We observed a strong association between the IGRA and risk for LTBI (p < 0.001). Low risk patients were 21 (23.3%), of which TST was positive in 11 (52.4%) and negative in 10 (47.6%), respectively. Conversely, IGRA was positive in seven (33.3%) and negative in 14 (66.7%) patients. Hence, TST results were not correlated with risk for TB infection, whereas a good correlation was found between IGRA and risk (Table 4). Using a threshold value of 0.51UI/mL for the IGRA yielded a ROC curve with 98.6% of sensitivity and 71.4% of specificity (see Additional file 1). We observed that only six patients at low risk of LTBI were positive for both TST and IGRA, while among patients at high risk, 48 out of 69 patients (69.6%) had double-positive results (TST and IGRA). The sensitivity (Se), specificity (S), positive predictive value (PPV), and negative predictive value (NPV) were estimated for both the TST and the IGRA, considering the risk as the main criterion for a diagnosis of LTBI (Table 5). Discordant results between TST and IGRA performed in 90 HIV-positive patients under the risk for LTBI are described in Table 6. Briefly, 21 patients presented negative TST and positive IGRA. In the present study, we compared the TST with QFT-GIT (IGRA) to establish which test would be most accurate for the diagnosis of LTBI in HIV-infected adults. We acknowledge that most of HIV patients analyzed were under antiretroviral therapy (ART) and consequently had adequate immunological and virologic control of the disease showing high levels of CD4+ lymphocytes (> 500 cells/mm3). This situation constitutes the ideal timing for the diagnosis and treatment of LTBI . Nonetheless, most of the studied patients were at high risk of LTBI. Categorizing patients with HIV into high or low risk may be justified by the poor performance of the TST for the diagnosis of LTBI, although it remains an important diagnostic tool in countries with a high prevalence of TB . The lack of a gold standard suitable for the diagnosis of LTBI and the difficulties in the interpretation of TST results, especially among immunocompromised patients, strongly contributed to our decision to consider risk as the main criterion for LTBI diagnosis. The classification as high or low risk for LTBI is rather arbitrary, nevertheless it was based upon clinical and epidemiological data. Additionally, we applied a scoring system to facilitate risk definition and considered the traditional concept of contact, following the definition provided by Rose . In our study, we identified significantly discordant results between TST and IGRA, as it was previously shown by other authors . The World Health Organization (WHO) studies concluded that TST may be inadequate for diagnosing LTBI in immunocompromised individuals due to HIV infection . Furthermore, previous studies have also shown that the chronic state of immunosuppression in patients with HIV may lead to false TST negative results, while giving some advantage to the IGRA test, as the latter seems to suffer less influence from low CD4+ T cell counts than the TST . Additionally, in immunocompromised individuals false-negative TST results may occur because late immunosuppression is directly related to T cell activities. Even though CD4+ T cell counts affect the IGRA results, this test seems to be more reliable than the TST for detecting LTBI in this population [27–31]. Another possible explanation for the discrepancy observed in the HIV patient is that the TST result may be negative within two to eight weeks after infection with TB due to a delayed-type hypersensitivity. On the other hand, it is believed that the conversion of the IGRA occurs much earlier after the infection . We found no significant association between the TST and LTBI risk but rather, there were a strong association between the IGRA results and the risk of LTBI in these patients. In fact, when compared to TST, IGRA was more sensitive and specific to identify patients with LTBI. However, the specificity of IGRA observed in our study was still lower than that found in other studies (> 90%), which may reflect some intrinsic characteristics of the Brazilian population [29–31, 33]. According to our results, a negative IGRA test in the person with HIV strongly excluded LTBI. By contrast, those with positive IGRA were more likely to have LTBI. Our data suggests that, when screening HIV-infected persons for LTBI, IGRA may be a better choice than TST. We are aware that our study presents some limitations, including the important lack of a universally accepted definition of risk of LTBI. Indeed, stratifying patients for high and low risk for LTBI is not an easy task, even with application of a scoring system and following the recommendations previously published . Nevertheless, we were able to show that IGRA detected LTBI with greater reliability, especially among patients presenting lower levels of CD4 + T lymphocyte count. Another limitation is the transversal design of our study, making impossible for us to follow up patients thus assessing the possible association between positive tests and progression to TB disease. Furthermore, TST and IGRA were performed only once for each HIV patient, hindering the possibility of evaluating future tests conversion or even reversal particularly among those who had shown discordant results between tests, which could have clarified the agreement between these tests with the diagnosis of LTBI. We also argue that a longitudinal study using the TST and IGRA for the diagnosis of LTBI would better answer this question and perhaps explain the greater agreement between IGRA with diagnosis of LTBI. Unfortunately, the definition universally accepted for diagnosing LTBI does necessarily include the performance of TST or IGRA test, which indeed may have biased our results. One attempting to assess the accuracy of a specific test for a defined disease or clinical situation, should not include the same test in the criteria for the definition. Nevertheless, our results showed a strong association between positive IGRA results and the high risk for LTBI in the HIV-positive population included in the study. Moreover, among those HIV-positive patients with lower CD4 count, IGRA accuracy was superior when compared to TST. This may represent a strong association between IGRA and epidemiological risk factors itself [3, 8]. In this context, a recent Brazilian Ministry of Health statement recommended that for those HIV-positive patients with CD4 count equal or lower than 350 cels/mm3, with a defined epidemiological high risk for LTBI and when TB disease was absent should receive therapy regardless of TST or IGRA test results [8, 34]. On the other hand, World Health Organization (WHO) recently recommended that preventive TB treatment should be offered for all HIV-positive patients unlikely to have active TB with unknown or positive TST, regardless of any CD4 count . Based on these results, we may speculate that following a clinical evaluation and categorization of risk, individuals with a normal chest radiography with no signs or symptoms of TB disease should undergo IGRA. Upon positivity of IGRA, patient should start treatment as soon as possible. When IGRA is negative, LTBI would be ruled out. For the diagnosis of LTBI, the risk of infection with TB should always be considered. In developing countries with high TB-HIV coinfection burden, and limited public financial resources, TST must be considered the first choice for LTBI diagnosis due to its low cost and ease of performance. In the detection of latent tuberculosis infection (LTBI) in HIV-infected individuals, IGRA showed a better performance than the TST and a better association with the risk of M. tuberculosis infection. Taken together, our study demonstrated that IGRA has a better performance than the TST for diagnosing infection by TB in HIV-infected individuals. Nevertheless, the challenge for a new diagnostic tool such as IGRA to become a gold standard for LTBI detection in patients with HIV. This project was funded by the São Paulo Research Foundation (Fundação Amparo à Pesquisa do Estado de São Paulo - FAPESP) Process no. 2011/05805-1 (Regular Research Project) and the National Council for Scientific and Technological Development (Conselho Nacional de Desenvolvimento Científico e Tecnológico - CNPq) Process no. 141705/2011-6. Immunology Laboratory of Prof. Dr. Reinaldo Solomão - UNIFESP for technical support. This project was funded by the São Paulo Research Foundation (Fundação Amparo à Pesquisa do Estado de São Paulo - FAPESP) Process no. 2011/05805–1 (Regular Research Project) and the National Council for Scientific and Technological Development (Conselho Nacional de Desenvolvimento Científico e Tecnológico - CNPq) Process no. 141705/2011–6. Neither FAPESP nor CNPq interfered in the study design, collection, analysis and interpretation of data and in writing this manuscript. The data set supporting the conclusion of the current study is available upon request from the corresponding author. Conception and design: GBK, DSR. Acquisition of data: GBK. Laboratory analysis GBK, NVFM; Analysis and interpretation: GBK MJCS, MNB, DSR. All authors contributed to either drafting the manuscript and MJCS revised the manuscript and gave final approval. GBK had full access to all the data in the study and takes responsibility for the integrity of the data and the accuracy of the data analysis. All authors contributed to manuscript revisions. All authors have read and approved the final manuscript. The study was approved by the Institucional Review Board of Instituto de Infectologia Emilio Ribas, 073/2011; Institucional Review Board of Irmandade da Santa Casa de Misericórdia de São Paulo, 023/11; Institucional Review Board of Universidade Federal de São Paulo (UNIFESP) and by Instituto Clemente Ferreira, CEP 0325/11. Before enrollment, all participants received a brief explanation of the aims, risks and benefits of the present study in each Institution from which patients were recruited. The participants signed an informed consent form. World Health Organization. Global tuberculosis report 2018 (WHO/CDS/TB/2018.20). Geneva: World Health Organization; 2018. 243p. http://apps.who.int/iris/bitstream/handle/10665/274453/9789241565646-eng.pdf?ua=1. Accessed 23 Sep 2018. Ministério da Saúde (BR). Secretaria de Vigilância em Saúde, Departamento de Vigilância Epidemiológica. Manual de recomendações para o controle da tuberculose no Brasil. Brasília: Ministério da Saúde; 2011. 288 p. (Série A. Normas e Manuais Técnicos). http://bvsms.saude.gov.br/bvs/publicacoes/manual_recomendacoes_controle_tuberculose_brasil.pdf. Accessed 05 Apr 2014. Ministério da Saúde (BR). Indicadores. Boletim Epidemiológico - Secretaria de Vigilância em Saúde - Ministério da Saúde. 2015;46(9):1–11. http://portalarquivos.saude.gov.br/images/pdf/2015/marco/25/Boletim-tuberculose-2015.pdf. Acessed 14 Jun 2018. World Health Organization. Latent tuberculosis infection: updated and consolidated guidelines for programmatic management. Geneva: World Health Organization; 2018. p. 1–78p. http://apps.who.int/iris/bitstream/handle/10665/260233/9789241550239-eng.pdf;jsessionid=EF4DDEDB879F6ADF516EB46BCC4AD932?sequence=1. Acessed 14 Jun 2018. Ministério da Saúde (BR). Secretaria de Vigilância em Saúde, Departamento de DST Aids e Hepatites Virais. Protocolo clínico e diretrizes terapêuticas para manejo da infecção pelo HIV em adultos. Brasília: Ministério da Saúde; 2013. 75 p. http://bvsms.saude.gov.br/bvs/publicacoes/protocolo_clinico_manejo_hiv_adultos.pdf. Accessed 5 Apr 2014. World Health Organization Global tuberculosis control: WHO report 2011 (WHO/HTM/TB/2011.16). Geneva: World Health Organization; 2011. 246 p. http://whqlibdoc.who.int/publications/2011/9789241564380_eng.pdf. Accessed 5 Apr 2014. World Health Organization. Guidelines for intensified tuberculosis case-finding and isoniazid preventive therapy for people living with HIV in resource-constrained settings. Geneva: World Health Organization; 2011. p 52. http://apps.who.int/iris/bitstream/handle/10665/44472/9789241500708_eng.pdf?sequence=1. Accessed 5 Apr 2014. World Health Organization. Use of tuberculosis interferon-gamma release assays (IGRAs) in low- and middle-income countries: policy statement (WHO/HTM/TB/2011.18). Geneva: World Health Organization; 2011. 61 p. http://whqlibdoc.who.int/publications/2011/9789241502672_eng.pdf. Accessed 5 Apr 2014. World Health Organization Guidelines on the management of latent tuberculosis infection (WHO/HTM/TB/2015.01). Geneva: World Health Organization;2015,38p. http://apps.who.int/iris/bitstream/10665/136471/1/9789241548908_eng.pdf?ua=1&ua=1. Accessed 23 Feb 2016. Ministério da Saúde (BR) Secretaria de Vigilância em Saúde. Nota Informativa n° 11/2018-.DIAHV/SVS/MS. Recomendações para tratamento da Infecção Latente por Tuberculose (ILTB) em pessoas vivendo com HIV (PVHIV). 2018. 4p.https://drive.google.com/file/d/1YQuovBq8UGSJlROgw-kRD7UMeVzc2Ezz/view. Accessed 16 Jun 2018.